Ren� Grandjean (November 12, 1884 in Bellerive - April 14, 1963 in Lausanne) was a Swiss aviation pioneer. 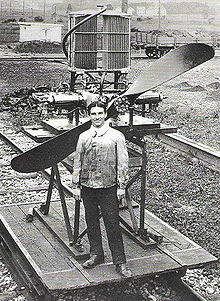 He designed and built the aircraft that was flown by Ernest Failloubaz for the first flight in Switzerland of an aircraft built and flown by Swiss citizen, was probably the first glacier pilot and was pioneering on seaplanes. In 1890 Grandjean's family moved to Paris where Ren� did his first studies before returning to Bellerive where his father built a mill and a big saw-mill supported by the young Ren� who was fascinated by the technics. At the age of 18 he moved again to Paris to find a job as a mechanics. Two months later, he was the driver for the marquis de Montebello and later in Egypt for the sultan Omar Bey who became his friend. In summer 1909, Grandjean started to realize his long time dream to build a flying machine; the news of Bl�riot’s flight across the channel convinced him to leave Egypt and to return to Switzerland. There he met Ernest Failloubaz, 17 years old, and thanks to his inventiveness and craftsman qualities, using only a picture of Bl�riot’s aircraft, he completed this first aircraft in October 1909. The ground tests started in February 1910 at l’Estivage field in Avenches. What is recognized as of today as being the starting point of the Swiss aviation, happened on May 10, 1910: Failloubaz piloted the machine, resulting in the first flight in Switzerland of an aircraft built and flown by Swiss citizen. 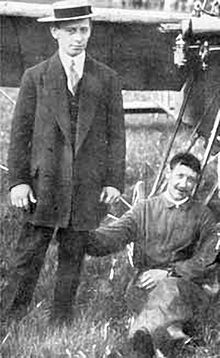 Ren� Grandjean succeeded five days after his friend’s first flight but crashed the plane. Immediately repaired, his aircraft was in August 1919 damaged again by Georges Cailler during a flight meeting in Viry, Haute-Savoie. On October 2, Failloubaz and Grandjean participated at the first Swiss flight meeting in Avenches, from October 8 to 10 in Bern. On October 12, 1910, Grandjean was prohibited from using l’Estivage airfield; the end of the collaboration between Failloubaz and Grandjean who moved to Dx�bendorf. In November he made major transformations on his aircraft and during that winter he learned to fly, by himself. In early 1911, Grandjean was hired by Oerlikon Contraves to promote their new engine by the manufacturer Farman, Bl�riot and Voisin. On June 18, 1911, Ren� Grandjean succeeded in crossing the Lake Neuchx�tel, on September 18 he obtained the Swiss pilot's licence number 21 and won the Prix d'aviation de l'Automobile-Club de Suisse on December 4, 1911. In December 1911 Grandjean was invited at Davos to fly above the resort; he pioneered in building ski to skid on the snow without sinking into it. 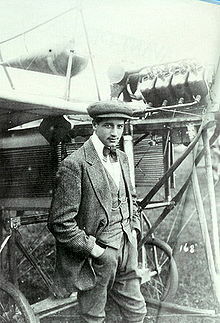 On February 2, 1912, he carried out the first take off and landing on ski in Switzerland, followed by more than hundred flights within few days without any incident. He was probably the first glacier pilot in the world. In summer 1912, Grandjean replaced the skis by floats designed and engineered by himself, resulting in the first takeoff of a Swiss hydroplane (seaplane) on August 4, 1912. At the controls of this seaplane he won several prizes, including the Eynard prize for the invention of a magneto allowing to start the engine from the pilot's seat. Grandjean was one of 12 Swiss pilots called up with their aircraft in late summer 1914 to form the latter Swiss Air Force. Nevertheless, he presented further inventions that did not find support in Switzerland. Grandjean decided to leave for Paris in 1915 where he rapidely became a very demanded technical counsellor, got patents for more than two hundred of his own inventions and returned definitely to Switzerland in 1956. On May 31, 1956, Grandjean was invited to inaugurate his own monument in Portalban on Lake Neuchx�tel where he landed after his crossing in September 1911. Then he participated with almost all surviving Swiss aviation pioneers to the 50th anniversary of Swiss aviation in November 1960 in Avenches. On May 10, 1965, a monument was erected in Avenches in memory of Ernest Failloubaz, complemented by a commemorative plate reminding his collaboration with Grandjean as the birth of aviation in Switzerland.